I can’t let it pass without noting the death of Masanobu Fukuoka at age 95. Fukuoka might best be described as the most pre-eminent Buddhist farmer. He advocated an approach to agriculture which some describe as permaculture, others might call natural farming. 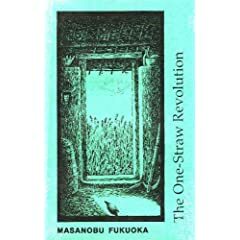 His most widely circulated book is The One-Straw Revolution. It’s on my winter reading list as I’m a bit sad to announce I haven’t yet read it myself. Here’s a short summary (well, not so short) of Fukuoka’s perspective on farming. This weekend Claire’s Envirothon was comped a weekend at a “bioblitz” inventorying animal and plant species on a new parcel of land acquired by the Iowa Natural Heritage Foundation in northeastern Iowa. Here’s a good portion of the group. One of Claire’s favorite tasks was mussel inventory in the river. They were accompanied by experts in mussel, bird, plant, and others in completing a biological inventory of the land parcel. This basket of peaches was just too beautiful not to share. We can now see the end of the peach season. This picture is also a bit of food for thought for all those naysayers that told us central Iowa was too far north to grow peaches! When the Costa Ricans visited our farm a few weeks ago, one gentleman excitedly moved me over to one of the gardens to tell me something. He pointed at the agaratum as said, “In Costa Rica, if you have an agaratum flower in your wallet, your wallet will not run out of money for a year!” I haven’t tried it yet, figuring a garden patch is good enough. Today was the first day of school for Emma and Martin. We’ve lucked out lately as the weather has turned normal and dry..